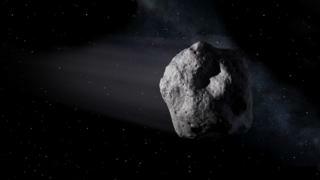 The first known asteroid to visit our Solar System from interstellar space has been given a name. Scientists who have studied its speed and trajectory believe it originated in a planetary system around another star. The interstellar interloper will now be referred to as 'Oumuamua, which means "a messenger from afar arriving first" in Hawaiian. The name reflects the object's discovery by a Hawaii-based astronomer using an observatory on Maui. It was discovered on 19 October this year by Rob Weryk, a postdoctoral researcher at the University of Hawaii Institute for Astronomy. Weryk and fellow Institute for Astronomy researcher Marco Micheli realised it was going extremely fast (with enough speed to avoid being captured by the Sun's gravitational pull) and was on a very eccentric trajectory taking it out of our Solar System. Scientists who have made observations of 'Oumuamua, say that despite its exotic origins, the asteroid is familiar in appearance. In a paper submitted to Astrophysical Journal Letters, they argue that its size, rotation, and reddish colour are similar to those of asteroids in our Solar System. Measuring about 180m by 30m, it resembles a chunky cigar. "The most remarkable thing about ['Oumuamua] is that, except for its shape, how familiar and physically unremarkable it is," said co-author Jayadev Rajagopal from the US National Optical Astronomy Observatory (NOAO). If planets form around other stars the same way they did in the Solar System, many objects the size of 'Oumuamua are predicted to be slung out in the process. "U1 may provide the first direct evidence that planetary systems around other stars ejected objects as they formed," said Dr Rajagopal. The object has also been given the more formal designation of 1I/2017 U1 by the International Astronomical Union (IAU), which is responsible for naming celestial bodies. The "I" in this formal name stands for "interstellar" object, similar to the "C" and "A" in the designations for comets and asteroids, respectively. 'Oumuamua is the first object to carry the "I" in front of its name.